The movie Ender's Game will release in November. When it does, it will feature a car created entirely in virtual reality just for the film by a team of designers at Audi. The concept, as you can see in the picture above, is exceedingly futuristic and very, very Audi in its look. For those unfamiliar with the "Ender series" by Orson Scott Card, it is a science fiction series centering on Ender Wiggins, a genius among geniuses who saves Earth from an impending alien attack and then learns the truth of what he's done and what it's meant for the universe. The first book in the series, Ender's Game is the subject of a new sci-fi film coming to theaters this fall, starring Asa Butterfield and Harrison Ford, among others. The car Audi made for the film has the uninteresting title of Audi Fleet Shuttle Quattro since it's function in the film is, literally, as a shuttle for Earth's fleet - the military that protects the planet from alien invasion and into which Ender is drafted at a very young age. This is the first time that Audi has ever produced an entirely virtual car for a film, though the company is not shy about showcasing its beautiful wares in films like the Iron Man series and its spin-offs. 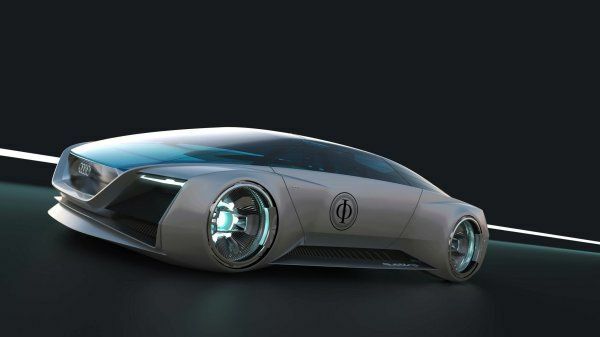 The Audi Fleet Shuttle Quattro was designed in collaboration with Ender's Game director Gavin Hood using some of Hollywood's latest cutting-edge digital technology. The car is exceedingly sleek, futuristic, and powerful. Audi definitely hit Vorsprung durch Technik here and if it weren't for its name, the car would be perfect.